A little over half way between the ferry terminal at Cairnryan and the city of Glasgow lies the attractive village of Minishant, which plays host to a very special Indian restaurant. It is situated in the former Minishant Memorial Church, which has been very tastefully and extensively renovated for the purpose, and has a unique ambience created by its architectural excellence. A beautiful, stained-glass window lights up the entire upper level, which is divided in two with a partial mezzanin-floor above for groups of up to about forty people. There is also a cosy downstairs room making a total of three separate indoor venues. Blessed with very adequate parking, it also boasts a tree-house for the children on the edge of a pine forest at the back of the car-park and well away from the road to ensure safety. On the other side is a large, wooden deck on which there are barbecues in summer, combining the three indoor venues with an outdoor one which has a very pleasant view over the surrounding countryside. 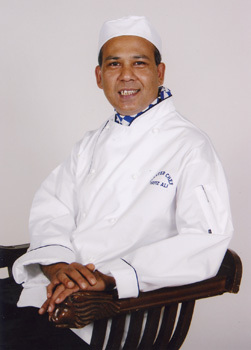 The co-proprietor is Mafiz Ali (pictured above) who trained in some of the country’s best Indian restaurants and climbed the ladder to fame in London by winning several prestigeous awards: (1996 “Indian restaurant of the year” won by the Essex restaurant in which he was chef at the time – 1997 “Indian chef of the year” awarded at the house of commons, and soon followed by a special award for cleanliness and hygiene, and then “Golden child of Sylhet” awarded by his local community in Banglaesh in recognition of his international success). 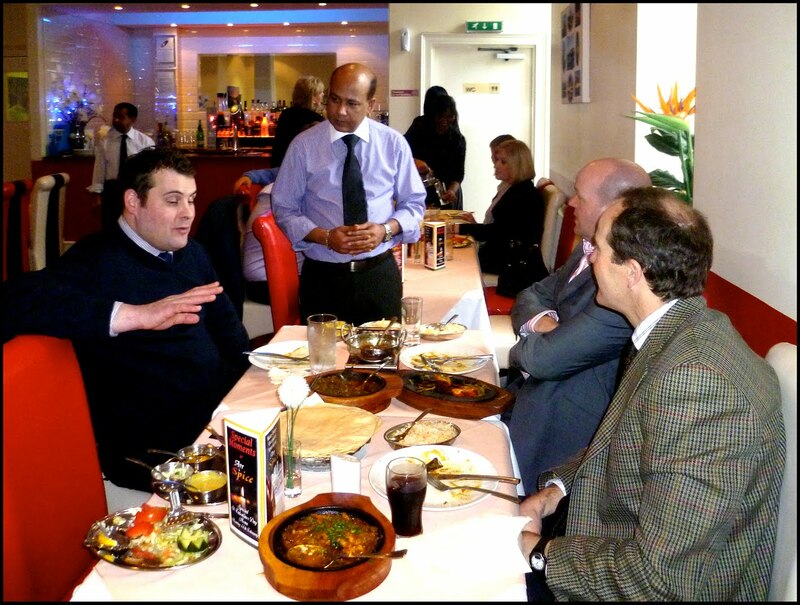 In 1998 he set up the Bangladeshi/British Curry Awards with the full backing of the principal politicians at Westminster, the idea being to bring together chefs of all ages, both amateur and professional, to compete for recognition of their skills and to promote Bangladeshi cuisine in the UK. It should be noted that 92% of all “Indian” chefs in the UK are from Bangladesh and not India! The newly-crowned “Indian chef of the year,” Mafiz Ali was invited by the then prime-minister John Major, an avid curry fan, to provide a banquet for his 50th birthday at No 10 Downing Street and one of the guests at that banquet subsequently invited him to deliver a replica to New York, initiating what must surely be an almost unique take-away business that has since delivered meals to Tokyo, Sydney, Atlanta and elsewhere! It has also seen him cater for the “X-Factor” and famous recording stars such as Cliff Richard, Matt Morrison, Soul to Soul and many more. The famous snooker star, Steve Davis was his regular customer in the south-east at this time, when he also earned a place in the Guinness Book of Records with the world’s biggest curry (4.5 tons of chicken korma, which was subsequently eaten at a huge charity event that opened the door to extend his activities in that field to include some of the country’s leading charities. Mafiz Ali has made 69 TV appearances and double that number on radio as well as contributing to many newspapers including the “Times”, “Sun”, “Daily Mirror” and many others. Among the stations he has appeared on have been Channel Four, GMTV, Big Breakfast TV, his own series on Bangladeshi TV and most recently in April of this year, STV. Into the bargain he has travelled all over the UK as guest chef, and wanted his very own restaurant. Although it is situated in a small village, its catchment area covers around 100,000 people living within a 20-minute car-trip and it is situated on the main route from Glasgow to Belfast via the ferries at Cairnryan. Driving north, the former church is situated at the far end of the village on the right-hand side of the road on a gentle, left-hand curve just before the end of the thirty-mile limit zone. The bell-tower of the former church cannot be missed, and there is a wide, drive-in gate giving safe access. The cuisine here is of notable excellence due to the prowess of its award-winning chef and proprietor leading a team of outstanding culinary experts. The table-staff is very friendly, obliging and efficient and their goal is not only to serve an outstanding meal, but to see to it that your visit is a memorable one enriched additionally by the warm ambience, the architectural environment and of course,the food itself. Reasonable divergence from the menu is also no problem and special needs are willingly catered for. There are additional, special menus for various events throughout the year, providing variety both in the cuisine and the special atmosphere of the occasion, be it the Bangladeshi New Year celebrations, Christmas, Easter, Mothering Sunday or the recent Royal Wedding. There are also plans to hold courses on how to cook select Indian food at the restaurant once the stress of the new opening has passed. “Ayr Spice” is well worth a visit, and it is fair to say that it is a treasure-trove for enthusiasts of Indian cuisine that is rapidly becoming a Mecca for such people, some of whom are prepared to travel from a distance to have the pleasure of a curry in uniquely inspiring surroundings – something that is likely to expand later in the year when the new “Curry Club” nights which include guest chefs and specials, are introduced.